Author: Joris de Vries. Series edited by: Michael Bollig, Wilhelm J.G. Möhlig. 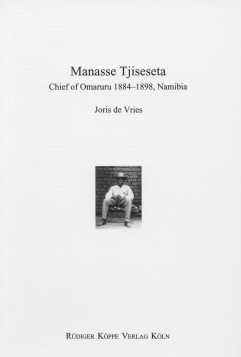 This book deals with the biography of Manasse Tjiseseta, chief of Omaruru in central Namibia between 1884 and 1898. He played an important but little recognized and scarcely documented role in the turbulent history of the Herero, and his actions had a lasting influence on this history. 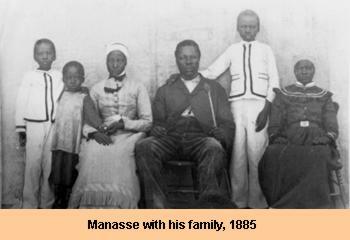 Manasse’s achievements have to be seen against the background of increasing German colonial influence in Namibia at the end of the 19th century, coupled with the policies of the co-operating Rhenish Missionary Society. His pragmatic leadership and diplomatic skills led the German colonial government to regard him as the most intelligent and at the same time most dangerous chief in Namibia. In the space of only a few years Manasse’s economic understanding led Omaruru to a considerable degree of prosperity. Yet he could not hinder that after his death in 1898 Omaruru eventually lost its independence. In his analysis the author uses so far unpublished photo material drawn from the National Archives of Namibia (Windhoek) and the archive of the United Evangelical Mission (UEM, Wuppertal / Germany), and political treaties in German and Afrikaans. English translations of the treaty texts and facsimile examples of the originals are included. The study is divided chronologically, starting prior to Manasse’s election to the chieftaincy of Omaruru and following the ebb and flow of his 14 years in power under the ever increasing influence of the German colonial establishment. On a more general level the book brings into view the political activities in Namibia against the backdrop of German colonial and missionary activities in Africa on the whole. Its intended readership comprises africanists, cultural anthropologists, ethnohistorians and historians of German colonial and missionary history as well as the broader public interested in the history and culture of Namibia. Its [the books] importance is enhanced by the fact that the editors of the series have added fourteen documents, including letters written by Tjiseseta himself, reproduced here in facsimile, and providing the reader with a personal glimpse of the chief.